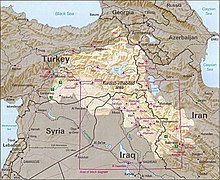 The Kurds are an ethnic group found in Turkey Iraq, Iran, Syria, Armenia and Lebanon. They have their own culture. Kurds are Indo-European settlers together with the people of Western and northwestern Iran, widely thought to be descended from the Medes. They speak Kurdish. Kurds have similarly distinct features like those of southern Europe, however their looks vary from blondes to brunettes and although they have mainly brown eyes they can have varied colours. They have a rich culture despite the long struggle by their neighbours to demolish it: it remains a strong influence on their way of life. Today, there are thought to be about 40 million Kurds. Most are Sunnite Muslim.